velascomike.com: Paseo Interlomas now open! Paseo Interlomas is finally open. I have been following on this project since 2008, long before any construction was made and the final project decided on. Now Paseo Interlomas has been opened and it looks great. Well not all the stores are opened yet, but the ones opened are nice. The mall includes three main stores, Liverpool, El Palacio de Hierro, and Sears. 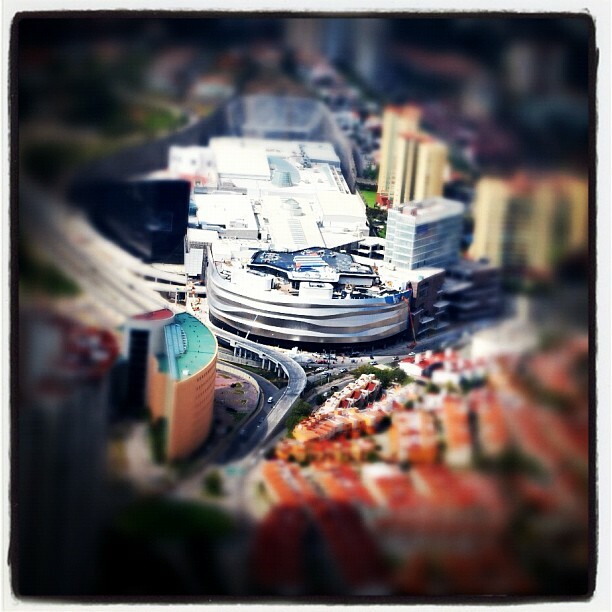 There is also cinemas, an ice rink, a food court, and a restaurant area. There are 110,000 square meters of retail area with 229 locals. The mall interior has wood highlights, very good natural illumination and ample spaces. The exterior has three elements that catch the eye: the restaurant area is covered with wood-like paneling and has terraces for the smoking areas of the restaurants; El Palacio de Hierro looks like a giant slab of black granite (think 2001: Space Odyssey) with a video screen on one corner; but the most intriguing design is the one of Liverpool, its facade is made of 7,5000 unique stainless steel panels that gives the illusion of the flow of the cars. The exterior of Liverpool was designed by the team of Rojkind Architects. Update: I'll update the list as I know of more stores in the mall and which ones are open. My previous posts on the subject: Paseo Interlomas, a new mall in the neighborhood and Follow up to Paseo Interlomas mall. Buscando información sobre este nuevo centro comercial me salió tu post!! como en tercer lugar en google! Thanks for the update! It's interesting to see how this project has continued to change after six years (initial design for the mall was begun in 2005 at RTKL in Dallas). Liverpool looks spectacular, and Palacio de Hierro is impressive, but the mall has been compromised a bit. There was obviously another architect hired after RTKL's involvement to redesign certain parts, especially at the restaurant terraces as well as the interiors. Judging from the first few pictures I've seen, RTKL's overall design concepts and massing were maintained, but the details and finishes have been greatly simplified. Still, it's a very nice project, and I'm proud to have been a part of it. Thanks for visiting and commenting. Yes, the mall doesn't win an award on parking design, but it start to make sense as you use it more. Regarding the elevator problem this is due as the mall is still unfinished and has some problems with infrastructure. I'm sure they will fix it, just give them some time. Muy interesate la información que pones, segun habia visto los directorios interactivos del centro comercial tambien van a abrir un 50 Friends, sabes si es correcto esto? Tambien me brinca que no hayan abierto un starbucks! Sabes si lo van a abrir?